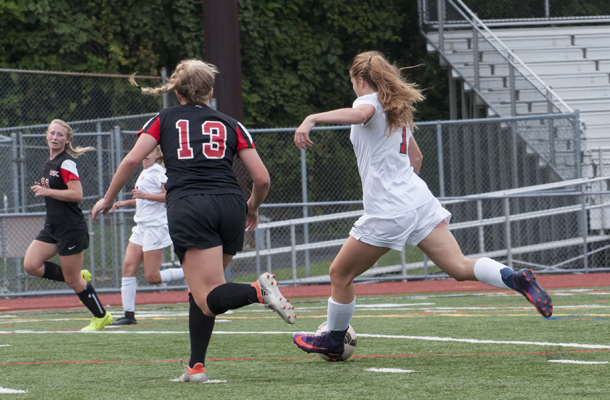 One might think avenging a last season’s quarterfinal loss to postseason rival, and defending WPIAL champion, Penn-Trafford would quiet the Fox Chapel girls soccer team’s hunger pains. Wrong. The 3-2 win over the Warriors in Saturday’s season opener was just the appetizer. When Fox Chapel (1-0) faces Butler (1-0-1) on Wednesday, things will be different this time around as both are in Section 1-4A and they will see each other twice this year. Fox Chapel begins the season against the final two opponents it saw in the 2017 postseason, and the Golden Tornadoe is next on the menu. There’s recent history between the teams. The Foxes rolled through the 2017 regular season, finished atop the Section 3-4A standings and were pushed to the brink of elimination at home against Butler in the first round. The Foxes needed penalty kicks to score a 2-1 win over a tough Butler squad. Even though the Foxes have made their runs in the WPIAL and PIAA postseason brackets, there’s been a thought Fox Chapel benefited from playing in one of the weaker Class 4A sections. Curry said the change in section and playing against some of the WPIAL’s top teams day-in and day-out almost certainly will be a challenge. She said it’s just as much of a physical challenge as it is going to be a mental one. The Foxes also will face Pine-Richland, North Allegheny, Seneca Valley, North Hills and Shaler in section play for at least the next two seasons. Fox Chapel regularly has scheduled tough nonsection opponents to fill out its schedule. With the help of first-half goals from Blair Echnat, Curry and Pitt recruit Sarah Sinnott, Fox Chapel jumped out to a 3-0 halftime lead in the opener before the Penn-Trafford came back in the second half and made it a game. Fox Chapel learned two things about itself: It’s talented on offense, and it can buckle down on defense. The game was a subtle reminder of the way the Foxes went about their business last season: jump out to a big first half lead, let the opponent back in the game in the second half and hang on for dear life until the end.